This is our first post so by way of introduction: Our branch of the Guild boasts 35 active members nearly half of whom are french. Some of our members are sheep and alpaca breeders. The textile network in Brittany is well developed and there is a strong sense of soldarity. This year has seen the launch of three new wool festivals and one of our members is in the process of setting up a small scale spinning mill. Examples of our Guild’s work is currently on tour in Belgium promoting the rare breed roux d’Ardennes- details to follow. Workshops and meetings are held in member's houses in turn and car-sharing operates. 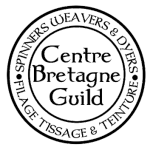 Our Guild comprises French and English members and people who have holiday homes in Brittany are welcome to visit us at summer events.